MINI is marketing their new 2013 JCW Countryman with a video meant to show off the new model&apos;s extreme side. Though probably not real, but a man in a wingsuit strapped to the roof and becoming in essence a human kite is pretty extreme. The 2013 MINI JCW Countryman recently made its debut at the 2012 Geneva Motor Show. 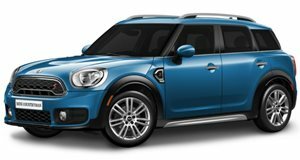 The powerful MINI makes use of all-wheel-drive and utilizes a 1.6-liter turbocharged engine rated at 211hp and 207 lb-ft of torque. Is that enough to sling-shot a man in a wingsuit over a canyon? No idea, but a cool concept to say the least.